The Easy Peasies® Wet/Dry travel bag is perfect for on the go parents who cloth diaper, need an extra change of clothes, love to enjoy the pool, and more! Made with waterproof fabric and dual zipping compartments, this multi-use bag has all the features you need to keep things dry, organized, or contained. Our medium sized hanging bag allows you to separate dirty from clean, or wet from dry items by using the double pockets to sort your items. The convenient hanging handle can be looped over doorknobs, changing room hooks, your wrist, or strapped onto shopping carts and strollers. Carry your reusable shopping totes in one, and strap it to your shopping cart. Bring it to the pool and carry everything you need for a day of fun. Store your baby carrier in the car and keep it contained, and clean. Have toddler you gets carsick? 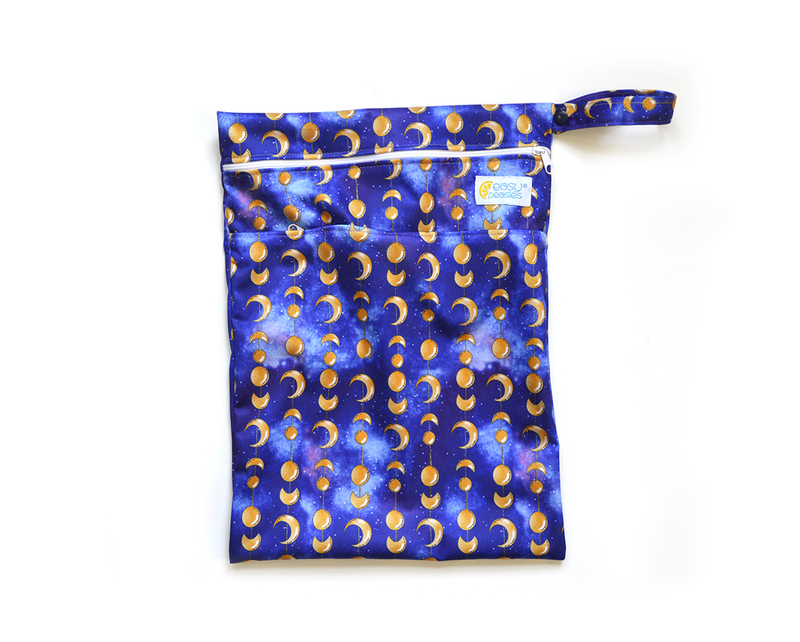 Carry an extra change of clothes, or soiled clothes in a cute and convenient bag. Store doll clothes, toys and much much more. Each bag measures 30cm by 40cm.